Location: Patteeswaram near Kumbhakonam . Description: This Shivastalam is a shrine patronized ardently by the Cholas who had Pazhiyarai (Patteeswaram) as one of their capitals. It is virtually next door to Darasuram, a storehouse of Chola art. Satthi Muttam is another shrine that is closely tied to Patteeswaram. The entire area around Pazhaiyarai Vadatali abounds in monuments and remains of monuments from the Chola period. Patteeswaram is considered to be the 23rd in the series of Tevara Stalams in the Chola kingdom located south of the river Kaveri. Patteeswaram was home to Saivaite mutts of great prosperity and influence; these mutts rendered invaluable services to the promotion of the Tevaram hymns and temple service. 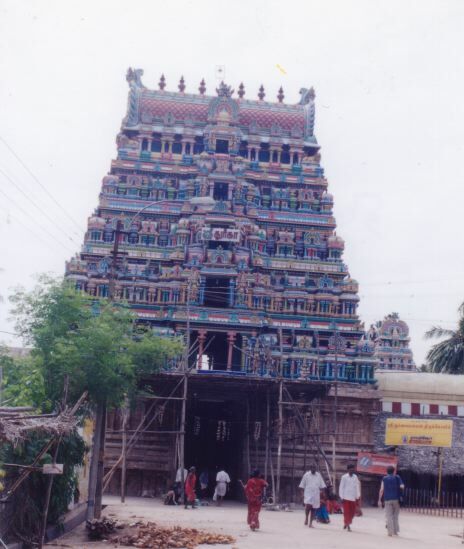 Patteeswaram is also closely associated with Govinda Deekshitar, minister of Achyuta and Raghunatha Nayak rulers of Thanjavur (late 16th and early 17th centuries). Govinda Deekshitar is associated with the construction of the Ramaswami temple at Kumbhakonam, and the repairing and remodeling of the Mahamagham tank at Kumbhakonam, and the building of the Pushya mandapam at Tiruvaiyaru. Legends: Kamadhenu's calf is said to have worshipped Shiva here. Rama's worshipping Shiva seeking pardon for the sin of having slain Vaali, is commemorated each year in the month of Margazhi (Saggitarius - New Moon). The Temple: Towering gopurams on all 4 sides and a beautiful tank adorn this vast temple with 3 prakarams. Gnanambikai and Durga are housed in separate temples.Durga's shrine here is of great importance. The Koti Theertham well in the temple said to have been created by Rama is considered to be equivalent to Dhanushkoti. Shiva is said to have blessed Sambandar with an umbrella lined with pearls, to protect him from the scorching summer sun, and is said to have requested the Nandi to move aside, in order to be able to look at the sight of his arrival here. The Ambal shrine is attributed to Govinda Deekshitar mentioned above. Images of Govinda Deekshitar, his wife and four of the Nayak kings of Thanjavur are seen in front of the Ambal shrine. Festivals: Six worship services are offered each day. The Mutthuppandal festival in Aani, Vaikasi Visakam and the annual festival in Margazhi are some of the festivals celebrated here. .Please see Pazhayaarai Vadatali for more information on this area. Templenet acknowledges Mr. C. Vedanarayanan for his contribution of the Patteeswaram temple tower image.